Several new textures for the Dress. Unzip and copy the data, People, and runtime folders to your "My Library" folder. Hi, I am new on the bloc and have no clue even how to use DAZ, but I am willing to learn. Thank you for letting me download Cherokee Tear dress. and love to help you with donating, but in what is the best currency to make over? I live in Australia. Oh forgot to mention, use Ctrl-F to find anything on any web page :D You don't even need a search window! Sir Drake, just search the Genesis section and you will find the dress for the textures! I love the dress and all these beautiful textures! Now place a direct link to the Cherokee Tear Dress! 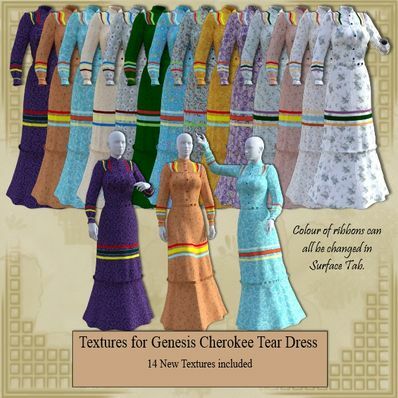 Thanks for creating and sharing these very pretty textures for your lovely Cherokee Tear Dress. Thanks also to eblank for the added textures. Thank you; these textures look very nice!